As I am now easing into my, what, fourth year of freelancing after three years working in Advertising, the ratio of freelance to not freelance years in my life has shifted firmly into the first category. It is the gig economy is what it is. So I’m starting a new series on my blog called Freelance Fridays, where I’ll talk about different aspects of freelance life as and when they come up, and try to field common questions I’ve been getting about work life in general. Aaaaand obviously the first post is more a generic one for all new working professionals.. not just freelancers. Hmm. Lets try to stick to the topical boundaries next time girl, but since we’ve already begun… Here are some decidedly awesome office gifts for a friend who’s just gotten a new job, a friend who’s just shifted office, or a friend who you just feel like buying something for. In all cases above, that friend can be you. Lets go. I work most visibly as a host, which requires a lot of on set time, but when I’m not shooting, about 90% of my work sees me holed up in my office space at The Hive Carpenter. So as someone who works at a desk all day, I can testify that two of the biggest non-job related concerns any deskbound person has is keeping track of their hydration and movement. There have been so many solutions offered up online, like setting an vibrating alarm on your smartwatch to get up and move (which requires a smartwatch that costs hundreds of dollars to begin with anyway), downloading apps that gameify the hydration narration (though I have to admit, Plant Nanny is pretty fun), or purchasing a standing desk/ replacing your office chair with an exercise ball (IDK about you but the asian in me quails at the potential awkward conversations and unnecessary attention this inevitably will trigger). But my absolute favourite solution is to just leverage the God given bladder we all have sitting in the vague regions of our lower abdomen. A giant water bottle or water canister is my current office desk mainstay. I used to use cups, but getting up and down to refill them gets cumbersome, and it gets easy to forget or brush it aside especially when work gets more intense over the course of the day. The sweet spot, I think, is a bottle which is about 750ml. Fill it up first thing in the morning, and because it’s right there, it’s easy to form the habit of reaching for it everytime you pause your work. Because it’s quite a bit of water, you’ll inevitably have to go pee every hour or so, forcing you to get up and move. Fill your bottle again on the way to/ back from the restroom. Seriously, this problem just solves itself. My girlfriend Xiaoqi got me the one pictured here which is my new fav. This is from Daiso, and you know what that means! TWO DOLLAH! You can get as fancy as you want with the bottle but remember, the most important thing is the volume of water it can hold. Well, luxurious by my standards. Refer to picture above to behold my absolutely unnecessary obsession – wireless charging. I spoke about this in my 2018 Things I was Impressed By post as well. A wire will perform the same function just as well, but just not as… delightfully? Honestly, I dont know. It’s one of those kind of extra things you dont need but will definitely love. I like the Samsung Fast Charge Stand because it props my phone up so I can quickly see the time/popup notifications and calls. I have a traditional Anker charging pad, but trust me, the experience is significantly different when the phone has to be placed lying flat vs just propped up on a stand. You know, I’ll just call it what it is: it’s varying levels of extra, and I love it, and I’m not even sorry. 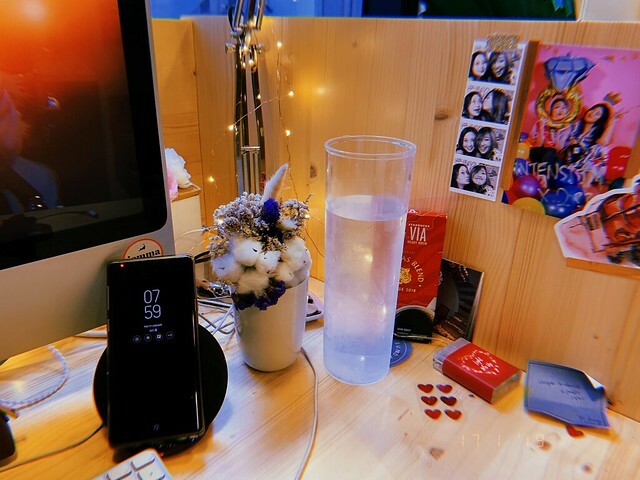 My sister bought me this mini desktop aroma diffuser from MINISO for christmas last year after I started burning candles all around our home and my office, and I am absolutely loving it. I’ve kind of had diffusers on my radar for awhile, because my parents have one from MUJI which makes their room smell like a spa, and I’d also bought my boyfriend one of the MUJI ones that he uses quite often. The only thing is, MUJI items are so pricey and I’m just not willing to spend that kind of money on me. I ended up buying a cheaper one on Lazada, but it’s bulky and lights up blue, which is very odd. And after that I kind of stopped searching for alternatives to Muji and resigned myself to just inhaling deeply whenever I go into my parents room. 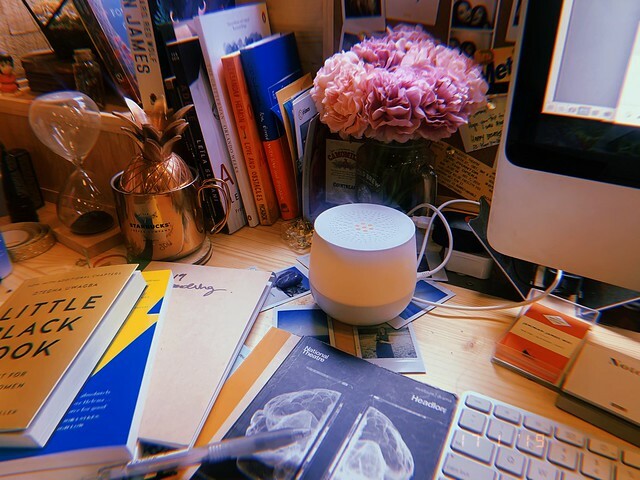 Enter the MINISO diffuser! It’s such a cute little size, it’s USB powered, and it makes my desk smell great. The white design is so minimalistic that it can probably blend nicely into any interior style, and the little warm light it emits when active isn’t jarring at all. Diffusers are also such a smart gift because they make future present buying easy. This christmas, a diffuser. Next christmas, a new bottle of essential oils. And because diffusers are just vessels, the gift recipient can just buy whatever scent they like so it’s not like committing to a $100 candle that they may find odd-smelling. In fact, having it on is such a mood elevator, that I cant imagine anyone who wouldnt be happy with this gift. Someone who doesn’t like being happy, perhaps. This is another one you can go affordable or high end with, but who doesn’t need a wireless mouse? A good wireless mouse can make a huge difference to your workflow, and it’s just nice not to have to deal with wires and such. 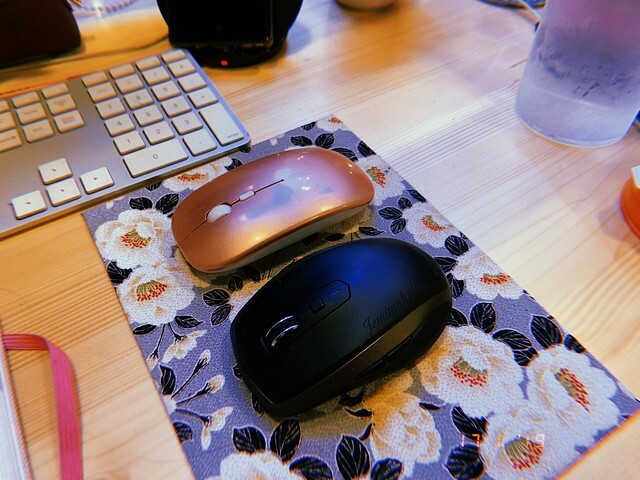 Nowadays, most wireless mouse… mice? are also USB charged, which means you don’t have to keep buying new batteries for them. Here you have a prime example of high end, low end. My pink wireless mouse is from Taobao, I think I paid $8 for it and have been using it for almost two years now. My black Logitech mouse (the MX Anywhere 2) is far more ergonomic and a joy to use, and depending on where you purchase it, it can cost anywhere from 70 to 100 dollars. Honestly, both are totally functional and I’m happy with both. It’s far preferable to using a wired mouse, and to be honest, in a day and age where you can get a perfectly decent wireless mouse for less than ten bucks, there’s no reason not to switch over. 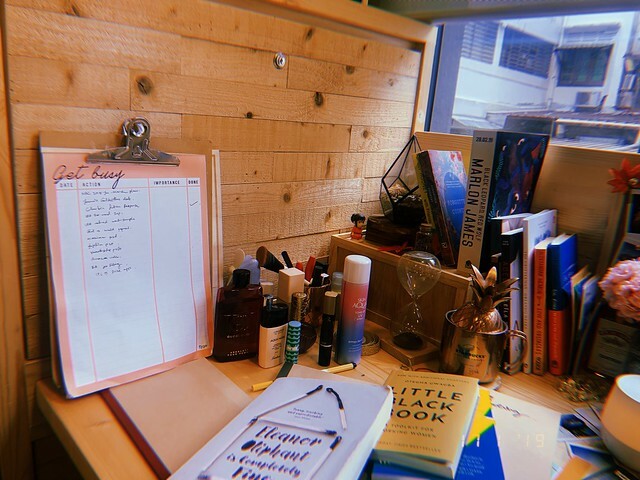 I quite like decorating any sort of space I have ownership over, which explains the state of my desk (a total affront to our darling Marie Kondo, I’m sure). One thing I tend to do is affix post-it notes, printed photos, polaroid pictures, so on and so forth to various parts of my desk. I have a small notice board, two dollars from Daiso, where I pin various memorabilia to, but I also use washi tape to stick pictures to my desk walls. Having one consistent tape color theme gives your desk an overall more coordinated, planned feel, even if the actual items are pretty haphazardly stuck on. Haha. 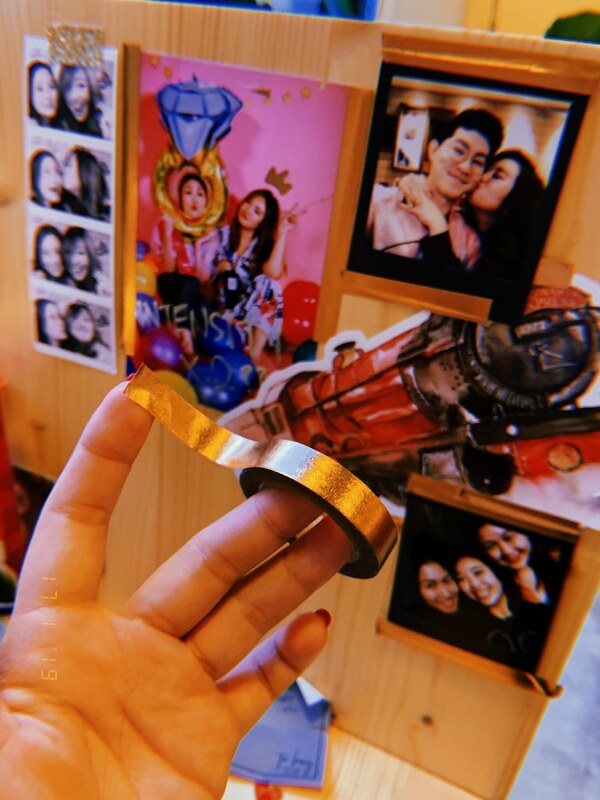 This copper foil washi tape I bought from Lazada for SGD$2 per roll, and I have gold glitter tape from Kikki.k which my friend Martin gave me a few years back as part of a stationery set for Christmas. The gift that sugarcoats your workload, because why not? I’m very much still a pen and paper girl at the end of the day, and although I’d experimented with Stickies (an electronic post-it app for your computer) and the like, I find it easier to keep my mind focused and on top of all the work i have to do when I can see it handwritten in front of me. I use a yearly planner from Starbucks x Moleskine on the go, but instead of flipping back and forth my calendar and to-do page, I have a paper to-do list from TYPO propped up with a clipboard against the side of my desk with a list of things I have to do. I refresh this list every other day or so, and it’s very satisfying to slowly check things off my list as I go along! I got the paper to-do list on sale for $5 (it was one of those year end clearance sales that TYPO often has) and the clipboard was also about $5 from a random shop, which has served me well for almost 7 years now. If you want something fancier, there are many fantastic paper companies that do paper planners, like Kikki.k and Rifle Paper Co. Even brands like Kate Spade have their toes dipped into the stationery business. It can get pricey fast though, and as with all paper products you kind of burn through them quick, so just think about how much youre wiling to spend before going crazy in the planners department. Let’s cut to the chase: get a foot rest. If youre sitting at your desk for hours and hours, it can really mess with your posture. Besides, the ability to put your feet up gives you an absurdly wonderful feeling. There are so many foot rest options – but what I did was buy a small DIY shelf off Ezbuy for about fifteen dollars, fix it up to about mid-shin height, and install it under my desk. Now throughout the day I can sporadically put my feet up while reading, typing, or just when trying to take a break. It really is all kinds of amazing.